Orange may be the new black, but for the spirit realm, gray is where it's at. For the last several centuries, ghosts and demons alike have preferred the traditional slimming and classically frightening black for their otherworldly garb. Not only does it hide zombie guts and blood splatter from messy vampire attacks, but it is extremely effective at helping to scare pesky peasants. Plus, black allows one to hide in the shadows located in dark corners of poorly lit rooms, at the top of the stairs, and even at the edge of an ominous forest. Yet, up and coming phantoms and the recently undead are eschewing the traditional black in favor of the much more flattering gray, which complements pale, bloodless skin better. Gray also hides cobwebs well and anyone who has every spent the night in a coffin knows that spiders leave cobwebs everywhere. Plus, you may have been a 'summer' in life but, in the afterlife, everyone's color palette is death. Your rotting green flesh is best accentuated by this new color trend. Embrace this new look with an ankle length dress featuring a tattered hemline and a trendy capelet. It offers just the right combination of glamour and gloom that well-dressed spirits love. 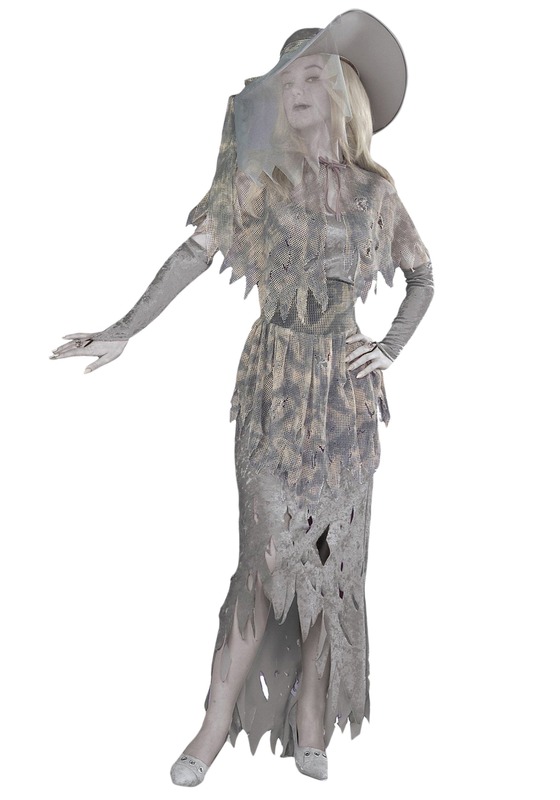 Plus, the veiled hat and glovelets allow you to bring a certain amount of sophistication to your hauntings. Nicely made. The hat and veil really make it spooky. I really like the costume and it's not like a lot of costumes that are cheesy and not worth the money. I definitely would buy from them again. doesn't look like the photo AT ALL. dress has no shape and is shorter than expected. cape and belt are smaller than the image shows, not the right texture at all, and overall absolutely hideous. Instead of regal, this outfit makes a person look frumpy and awful. i tried to find a way to make them work, but wound up having to buy a different costume. very disappointed, and will not buy here again because of return policy. 18% restocking fee. Hello! Thank you for your input. in looking at your order information, it seems that you did not reach out to us for help with any concerns you had about the quality of the costume. We have a great exchange program, and could have sent a replacement order for the same costume in a different size, another costume of your choice, or simply refunded the order on return.